Thanks to Mike Conlon, we first heard of this small ski area that operated at The Cranwell Preparatory School in Lenox. The area is now called the Cranwell Resort, Spa & Golf Club, and can be visited by clicking on that link. "Back in the 50s and 60s, for sure, and maybe into the 70s, there was a ski hill with a single rope tow at Cranwell Preparatory School in Lenox, MA. A lot of students who went to the school learned to ski there. The school closed in the mid 1970s and with it the rope tow, I believe." 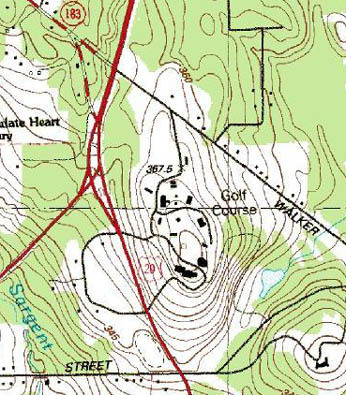 Here's a topo map of the former school, now resort. It is unknown exactly where the tow ran, but the vertical was short. 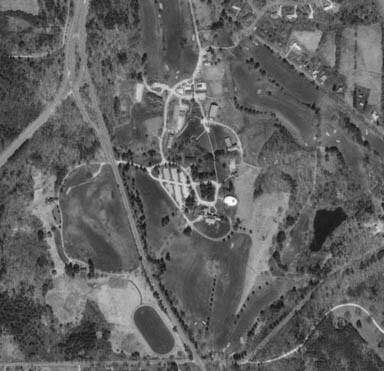 Here's an overhead view of the former school, now resort. Bill McConville: I was a student at Cranwell Prep up until they closed the school in 1975. I was on the ski team, and we practiced racing and trick jumping on the slope there. (we were the precursors of the trick skiers and boarders you see today). It wasn't too long, but it was fairly steep in places. The rope tow was still functional up until that time. After the school closed, I don't know how long it remained functional. I understand that Cranwell is now a resort and the golf course is still in use. Tom Dwyer: I was a student at the school from the fall of the 1944 until I graduated in the spring of 1948 and taught myself to ski on the hill there. I wasn't as lucky as the two former Cranwell students who have previously reported to you because there was no lift in my day so I had to climb back up after each descent. Of course if it had snowed heavily the night before then I and my fellow fanatics had to pack it down first which took most of the afternoon. The hill terminated in a fairway on the school's golf course and to reach it the skier had to pass between two sand traps near the bottom which were about five feet apart. If his aim was off he would fly over the edge of one of the traps and crash at the bottom. There were many such finales to ski runs on that hill! There was also a ski jump nearby made out of an old door which saw a lot of action. By my senior year I had become an accomplished skier but had never rode a ski lift so a friend and I decided to go to Beartown State Forest in South Lee which had a rope tow and is another of your lost ski areas. As we had no access to conventional methods of transportation we reached it on skis (the bindings in those days could be adapted for either downhill and cross country) by following the tracks of the New York Central Railroad that ran through the valley not far from the school. The distance was about five miles but when we got there we discovered that the place was closed for the day. Undaunted, we climbed to the top and made one run before heading back to school, arriving just in time for dinner. Although now in my mid-seventies I still downhill ski and I attribute this to all those herringbones up that hill at Cranwell. Hermy Henriquez: I graduated Cranwell in 1963. Being from Panama, I was introduced to snow skiing at Cranwell. I never reached expert, but learned enough on that hill with its famous rope tow to be able to take trips to Mt. Snow and major slopes, AND be able to get down some of the intermediate runs. My rented learning skis were wood, with bindings that my peers referred to as "bear traps",,,,there was no way my skis would ever come off no matter how hard I might crash! But that slope was a great place to learn,,,down fast and almost back up as fast on the rope tow with its diesel chugging in the background. I also remember going down on a four man toboggan,,,,and when we hit the road that ran across the bottom, we all went flying in the air like shrapnel. Very fond memories of Cranwell and the hill. Do you have more info? If so, email us and let us know.